ACK! I totally forgot to post this Friday afternoon/evening and just now remembered it. Who is your favorite Tudor monarch? If you could go back in time and witness just one of the following events, which would it be? 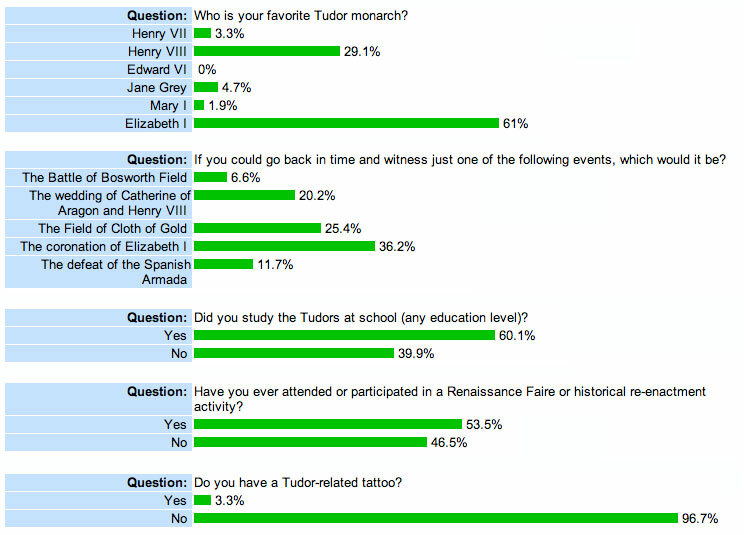 Did you study the Tudors at school (any education level)? Have you ever attended or participated in a Renaissance Faire or historical re-enactment activity? Do you have a Tudor-related tattoo? I don't think I've heard mention of a really beautiful album: My Lady Rich by Emily Van Evera. The songs were chosen for their relevance to the life of Lady Penelope Rich, and are performed in period style, with period instruments. It's just gorgeous!